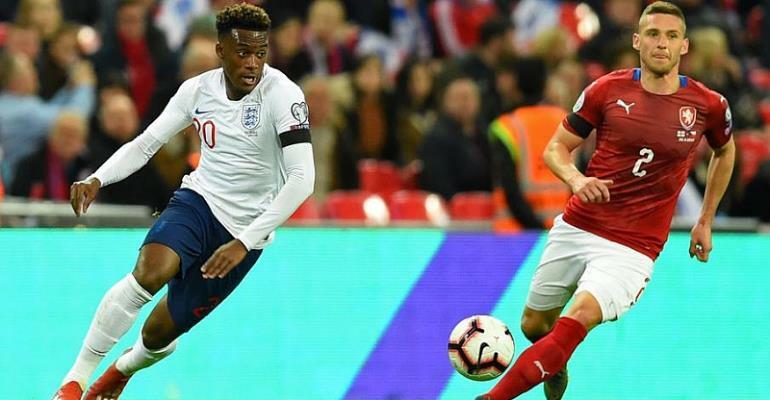 Callum Hudson-Odoi was left surprised to be given the chance to make a record-breaking England debut as a substitute in their 5-0 drubbing of the Czech Republic at Wembley on Friday. The English born Ghanaian international was initially supposed to join up with England's U-21s but was handed a late call-up to manager Gareth Southgate's senior squad after four players withdrew due to injury. The highly-rated winger replaced hat-trick hero Raheem Sterling with 20 minutes to go in the European Championship qualifier, becoming the youngest player to make his England debut in a competitive match at 18 years 135 days. The Chelsea youngster even forced a save off Czech goalkeeper Jiri Pavlenka, only for defender Tomas Kalas to clumsily turn the ball past his keeper for an own goal.